The Mid-Autumn Festival is coming up on Thursday, September 15. Sometime between this week’s events be sure to buy some mooncakes. Update: Added lectures and a panel discussion at Christie’s. October 6 and 7 – Abacus: Small Enough to Fail, a film at the New York Film Festival about the only bank to be indicted in the wake of the 2008 financial crisis. 1) What About the Art? Focusing on Creativity in Artistic Practices – This half-day symposium, organized in collaboration with artist Cai Guo-Qiang, focuses on creativity, artistic expression and methodology. At a time when major exhibitions and biennials often focus on popular topics such as the environment, violent conflict, and cultural identity and context, there continues to be a lack of direct inquiry into the creative process and artists themselves. This was an issue raised in the recent exhibition curated by Cai Guo-Qiang at the Qatar Museum in Doha entitled What About the Art? Contemporary Art from China [NY Times review]. While these sociopolitical topics are important, equally crucial is a focus on artworks and artistic practices. Two specialized examine the importance of these considerations when curating in a global context. The artist, curator, and critic Robert Storr will give a keynote presentation; other participants include the artist and curator Cai Guo-Qiang; visual artist Ann Hamilton; Tim Griffin, Executive Director and Chief Curator at The Kitchen; Laura Hoptman, Curator, Painting and Sculpture, The Museum of Modern Art; Joachim Pissarro, Bershad Professor of Art History and Director of the Hunter College Art Galleries; and Nancy Spector, Deputy Director and Chief Curator at the Brooklyn Museum. The symposium will open with a screening of the 70-minute documentary film What About the Art? (directed by Shanshan Xia) featuring Cai Guo-Qiang’s candid conversations with thirty international artists and specialists on questions surrounding the exhibition. 2) Commemorative Symposium on Yu Daifu, A Pioneering Writer of the early 20th Century – Yu Dafu (郁達夫) was a popular short-story writer and poet of the 1920s in China and one of the founding members of the Creation Society, which was devoted to the promotion of modern literature. In celebrating his 120th birthday, the Renwen Society at China Institute and Flushing Library jointly presents a symposium on Yu Dafu’s life and works. Speakers include Prof. Yu Renqiu of SUNY at Purchase, Mr. Wang Hailong of Columbia University, Dr. Sun Dong, Chinese Director of the Business Confucius Institute at the Global Center of SUNY and Paul Qiu, Deputy Director of Flushing Library. Ms. Ma Lin, a top pipa player, will pay tribute to the author with a moving pipa performance. Ms. Guo Xin, a graduate of Columbia University, will recite a prose by Yu Dafu. Yu’s offspring will be attending the symposium. The program will be in Chinese. Free, but advance registration required. 3) First Responders: An Art Exhibition by Yang Yi Opening Reception – An exhibition dedicated to the first responders to World Trade Center following the terrorist attack on 9/11. See below for full exhibition details. 4) Introduction to The Roy and Marilyn Papp Collection of Chinese Paintings by Dr. Claudia Brown of the Phoenix Art Museum – Dr. Claudia Brown of the Phoenix Art Museum will discuss The Roy and Marilyn Papp Collection of Chinese Paintings, which features more than 120 lots and reflects over two decades of visionary collecting. Highlights include an oversized handscroll by the acclaimed landscapist Wang Hui as well as extraordinary works by Shen Zhou, Wang Yuanqi, Song Xu, Lan Ying and many others. 5) Christie’s Asian Art Week Lectures and Discussions – As part of Asian Art Week, the auction house hosts two lectures and one panel discussion relating to Chinese art. 6) Why Zao? Why Now? – Join guest curator of No Limits: Zao Wou-Ki Melissa Walt for an in-depth talk exploring the diverse influences of Zao Wou-Ki’s singular artistic vision, and his role as a pioneering figure in global abstraction. Walt is a scholar of modern and contemporary Chinese art and a research associate at Colby College. The lecture is billed as members only, but contact Asia Society to see if the requirement can be waived. 7) 150 Years of Chinese American History – Laundry and railroad workers, silent film star Anna May Wong, and hate crime victim Vincent Chin: these icons of Chinese American history become recast in The Fortunes (Houghton Mifflin Harcourt 2016), a new multi-generational novel by the award-winning author Peter Ho Davies. Born in Britain to Welsh and Chinese parents, Davis is a Guggenheim and NEA Fellow and was named by Granta as one of the Best Young British novelists in 2003. Come see the Michigan-based writer for a rare New York appearance and hear him discuss a book that novelist Celeste Ng calls “the most honest, unflinching, cathartically biting novel I’ve read about the Chinese American experience.” Davies will appear in a moderated conversation with AAWW Executive Director Ken Chen. 8) Scholars’ Rocks from the Collection of Kemin Hu – In this discussion and sale event, Kemin Hu, one of the foremost experts on “spirit stones” presents a newly acquired collection of scholars’ rocks and discusses the ancient art of the scholar’s rock and stone appreciation, describing the various stones, their history and characteristics. Ms. Hu’s books will be available for purchase and signing. 9) Historical Roots of Modern Taiwan: 17th Century Formations – Xing Hang, Brandeis University. Part of Weatherhead East Asian Institute’ and the Department of Anthropology’s Modern Taiwan Lecture Series, hosted by faculty members Myron L. Cohen and Murray Rubinstein. 10) Gourmet Food Circle: MáLà Project – Join China Institute’s Gourmet Food Circle for a culinary journey exploring spice. Discover dry hotpot through a carefully curated menu paired with Tsingdao Beer, Wang Laoji and storytelling at the hip new eatery Málà Project. Owner Ning Amelie Kang and chef Qilong Zhao will share their story. Attendees will be included in a lucky draw to win a $50 voucher from the restaurant. 11) The Tangled Dynamics of Independent Filmmaking in China: Memory, Identity, and Protest – Paul G. Pickowicz, Distinguished Professor of History and Chinese Studies, University of California, San Diego. Moderated by Ying Qian, Assistant Professor of East Asian Languages and Cultures, Columbia University. 12) Partners in Crime 《共犯》– An ordinary day in an ordinary campus, until a girl who was loved by everyone kills herself. Everyone is asking why, but no one knows the truth, except three students: the good, the bad and the weird. They know why, and decide to do something out of the ordinary as a means of revenge. They are partners in crime. Read The Wall Street Journal China Real Time Report’s interview with the director and Variety‘s mostly favorable review of the film. 13) City of Hands – This 22-minute short film profiles four young members of Jingdezhen’s ceramics community and explores what brought them to the city and what made them stay. Jingdezhen is China’s porcelain capital. Slowly forgotten after being home to the emperor’s imperial kilns for a thousand years, the city is now filled with young artists. An oasis for creatives in China’s urban east, people from all over the country come to Jingdezhen to follow their porcelain dreams. Wing On Wo & Co., 26 Mott St.
14) No Cause for Alarm Opening Reception – See below information about this exhibition featuring the mixed-media installations, video and performance works of eleven artists from Taiwan, Hong Kong, and China. La MaMa Galleria, 47 Great Jones St.
14) Jammin’ Shanghai – Jiayi Song’s short documentary film about the jazz scene in Shanghai is one of ten short films of the New York Film Academy Documentary Film Festival. The glamorous and colorful jazz scene of Shanghai has been long forgotten. An American saxophone player, Alec Haavik, came to Shanghai fourteen years ago, where he joined the JZ Club. The JZ Club helped revived jazz culture in Shanghai. While it moves out from its original location, it hosted with one last commemorative gig. 1) Chan is Missing – Two San Francisco cabbies, Jo and Steve (Wood Moy and Marc Hayashi), band together to scour Chinatown for Chan, a sketchy go-between who’s taken off with $4,000 of their money intended for a cab license. The debut feature of Wayne Wang (The Joy Luck Club, Smoke) is a milestone in Asian-American cinema, a hugely influential, deadpan, shaggy dog mystery that plays with the legacy of film noir. Read about the film from Wikipedia. At Metrograph September 9 – 15. 3) Caught – In this irreverent new genre-bending piece, theatre makers Christopher Chen and Lee Sunday Evans apply their playful imaginations to the work of a Chinese dissident artist. Their hybrid work invites you to navigate a labyrinthine trail between truth and perception, authority and authenticity, illusionary art and real jeopardy. The play was inspired by performance artist Miao Jiaxin‘s Jail’s Seeking Prisoners and was named an Critic’s Pick by The New York Times. You can also read more about it here. In addition to the listings below, as part of Asia Art Week, Christie’s and Sotheby’s will be holding pre-auction viewings for Chinese art objects which are open to the public. Ping Wang exhibits his photographs inspired by dreams and the surrealist movement which use strong lighting and symbolism to create an atmosphere of psychologically charged unease at SVA’s In Cylinder group exhibition 8/13 – 9/10. 1) Erote (The Hollows Art Space, 9/7 – 10/30) – Erote approaches the concept of garment as a means to frame the body, assumed as a catalyst for achieving affects, foremost in the Self, including design ideas from ancient times to very recent innovations, ﬂattening Time, and treating each designer or the stylist as an individual who is in search for a pleasant functionality. Exhibited pieces are accessories that preserve one’s body and help the wearer communicate with the world and getting by in it. Includes works from 20 artists, including Yuchen Chang, Chapeau Echo, HE + HU, Stephanie Liu, and Vixole x Yuxi Cao. 2) Xu Zhen (James Cohan Gallery, 9/8 – 10/8) – This solo exhibition by the multi-disciplinary Chinese artist Xu Zhen is the third at James Cohan and the largest presentation of his art in New York since 2009. 3) Yang Yi: First Responders (Chinatown Soup, 9/10 – 9/30) – The Asian American Arts Centre presents this solo exhibition featuring the work of artist Yang Yi (楊億) in collaboration with Chinatown Soup and in partnership with Chinatown Partnership Local Development Corporation – CPLDC. 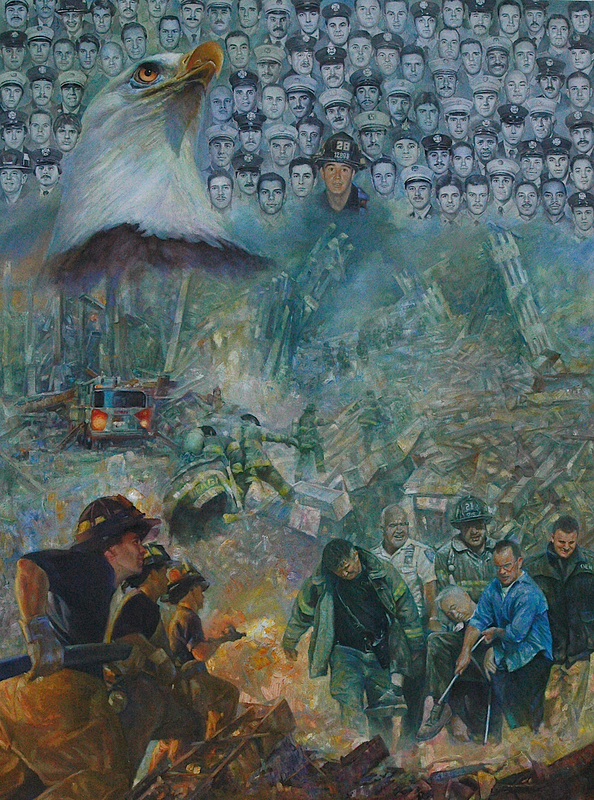 Inspired by a mural on the side of a Flushing firehouse, Yang, age 59, worked out of his small apartment for five years, often setting aside his work as a portrait artist in Central Park, to create a pentaptych that gives tribute to the brave members of the FDNY and paramedics, featuring all 343 faces of the first responders who were killed at the World Trade Center 15 years ago. Yi’s work has struck a chord with the firefighters who have previewed it. 4) Hung Liu: American Exodus (Nancy Hoffman Gallery, 9/8 – 10/22) – Hung Liu is primarily known as a painter of Chinese subjects, typically from the 19th and 20th centuries. Born in China in 1948, and living through the war, famine, and perpetual revolution of the Maoist era, it is little wonder that Liu’s paintings, since immigrating to America in 1984, are based on historical Chinese photographs. Her new paintings, however, are based upon the Dustbowl and Depression era photographs of American documentary photographer Dorothea Lange, whom Liu has long admired. A resident of Oakland, California, the artist – whose retrospective exhibition was organized by the Oakland Museum of California in 2013 – was surprised to learn that her hometown museum was also the repository of Lange’s photographic archive. As a painter, Liu challenges the documentary authority of photographs by subjecting them to the more reflective process of painting. Indeed, much of the meaning of her paintings comes from the way the washes and drips dissolve the photo-based images, suggesting the passage of memory into history, while working to uncover the cultural and personal narratives fixed – but often concealed – in the photographic instant. She has written: “I want to both preserve and destroy the image.” Given the historical, often tragic subject matter she represents, her style is a kind of weeping realism. Shifting focus from the people in Chinese historical photographs to the migrants in the Depression-era photographs of Dorothea Lange may seem a surprise to Hung Liu’s audience, at first. But by training her attention on the displaced individuals and wandering families of the American Dustbowl (and beyond), Liu takes a second look at a society’s photographic remnants, and what she finds in Lange’s photographs are subjects whose overarching struggle and underlying humanity are not so different from the Chinese refugees, soldiers, prostitutes, and workers she has painted for decades. In Liu’s paintings, all are caught by the camera in an everlasting moment and then summoned, like ghosts, onto the waiting canvas, where they are painted in a mineral ground and washed in linseed oil. The meaningful distinction is that the subjects in Liu’s new paintings are American peasants who, unlike their Chinese counterparts, may be stuck in poverty, but not in place. Chinese peasants are often scattered to the winds by the forces of history, while the Okies and Bindlestiffs in Lange’s photographs, though desperately poor, tend to be on the move, or settled temporarily in migrant camps. They were scattered by the forces of nature. Their common goal was to get to California, the promised land. Within twenty years of Lange’s photographs, mobility would become the great American metaphor. Though many of these migrants came to bitter ends, they most always came from somewhere else. Read more from the press release here. 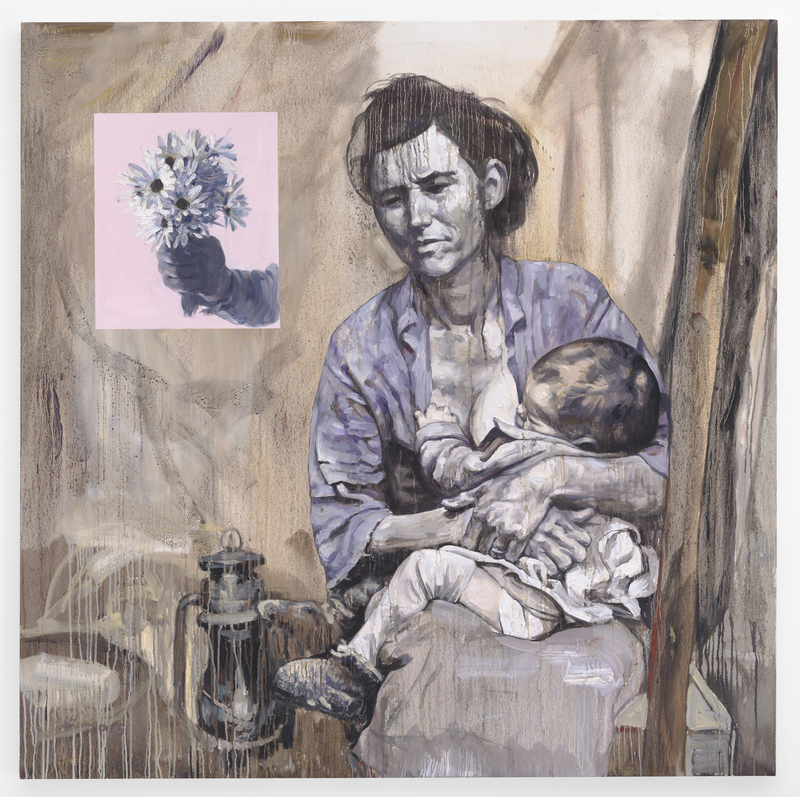 Hung Liu – ‘Migrant Mother’, 2015. Oil on canvas, 66 x 66 in. 5) No Cause for Alarm (La MaMa Galleria, 9/15 – 10/8) – No matter where you live, people living in the city are facing various kinds of stresses and pressures. It could be coming from the society, system, work, family, or simply ones’ own expectation. No Cause for Alarm is an exhibition trying to investigate the nervousness in contemporary city life. The exhibition is focusing on the possibility but not the situation itself, because ‘situation’ is a state of flux that changes from time to time and varies from place to place. There is no point to discuss the situation without thorough understanding of the causes and consequence. However, possibility implies potential and the unknown, which encourages imagination and creativity. By understanding our own position in certain situations, we try to come up with suggestions and consolations, which aims to ease the tension as well as reducing the alert. Artists taking part in this exhibition are invited to meditate the current moment, unveil the overlooked in modern city life, and investigate the hidden conflicts in the vibrant metropolitan. There is no pre-established perception or criticism, we are not pessimistic and have no intention to satirize or ridicule our society. We are trying to suggest an alternative way of being from a witty and humorous perspective. We are living in a skewed social structure where various established meanings, and different forms of active or passive resistance are all put up in response to our sense of existence. Artists making improper expressions under inappropriate occasions always render distinct interpretations from their own perspective when they face any institution. These artists propose diverse analysis of the dramas, strangeness, nonsensical dialogs and narratives of daily life. They also question the evolving nature of the “ecology of the art world.” Their humorous approaches of dealing with reality imply a way of co-existence. Toying with familiar daily object and our common experience, Wang Ding-Yeh, Huang Yen Ying and Tang Kwok Hin are trying to examine what is generally accepted in the society. Tsui Kuang-Yu, Song Ta and Musquiqui Chihying investigate feasible ways of social intervention from various angles. They explore the boundary of urban environment and contemporary life, to disclose how habitual thinking in daily life influences the mode of thinking and behavior of the public. Su Yu-Hsien and Luke Ching Chin Wai respond to and question the political and cultural clashes in the city with a humorous manner. Chou Yu-Cheng, Ocean Leung and Yip Kin Bon are known for their practice of collage through various means. They piece together different social structures and perspectives; and patch up a reality, a conspiracy, a farce, or an imaginary future. 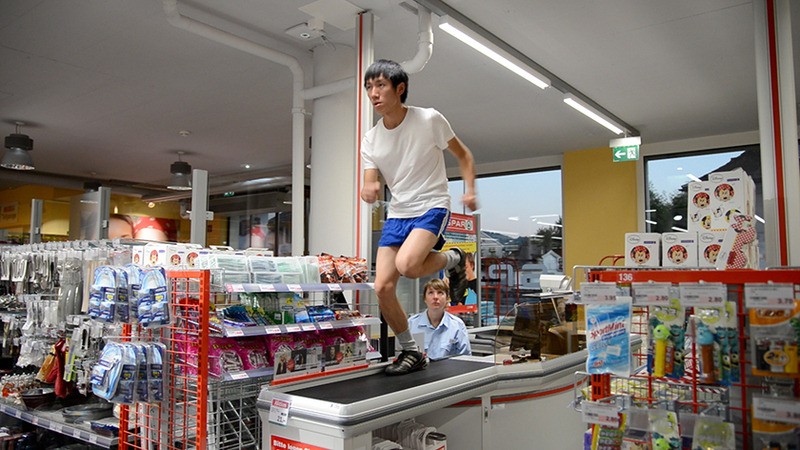 Musquiqui Chihying – ‘The Jog’, 2014. Visit the exhibition calendar for details for the current shows listed below. As always, check the museum or gallery’s website for hours of operation. Lead image: From Flickr user Luigi Andreola. Licensed through Creative Commons.